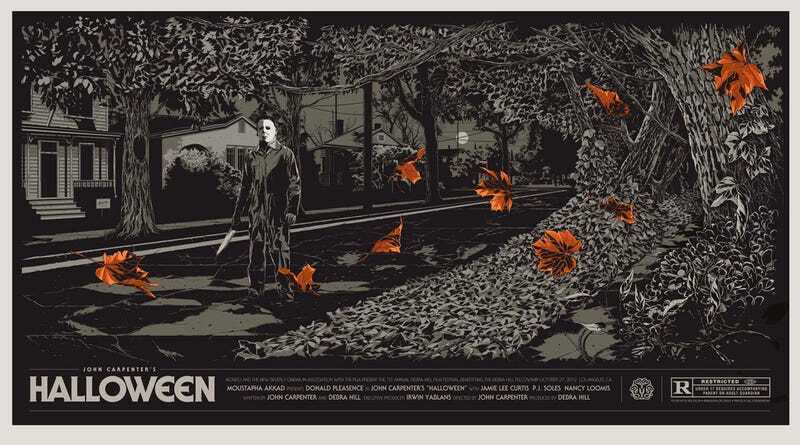 Most people would agree that John Carpenter’s Halloween is a legitimate masterpiece. Long before anyone was scared of Elm Street or Crystal Lake, the film basically invented the slasher genre. And while it’s easy to say how great it is, it’s harder to watch the film and point out exactly why that is. Thankfully, almost every single frame of Halloween backs up its greatness. Carpenter’s film is simple, subtle, and built to terrify you by showing as little as possible. It’s way more Jaws than it is Jason or Freddy. Most movies start with some silence or simple music over the opening credits, but Halloween goes a step further. When it does start, the movie instantly starts screwing with the viewer, merely by showing a house. Now, years of watching movies have conditioned us to believe this is an omniscient shot, which is to say it’s not from the point of view of a specific character, of the house and the couple in the doorway. It’s when the camera moves to the side of the house, peeking at the young couple making on a couch through a window, that it’s suddenly evident that the camera actually does represent someone—someone who enters the house and picks up a knife. After briefly hiding when the young man in the couple comes downstairs and exits the house, the camera slowly begins to go up the stairs where we know the girl still is. The person it represents sees a mask on the ground and puts it on—hiding an invisible, seamless cut where camera reel had to be changed, allowing the scene to appear one, continuous shot—and enters the room where the girl sits, naked, brushing her hair. When she notices us standing there, she screams, tries to cover herself up, and calls us Michael. And then it begins. We’re just a child. The brother of the victim, in fact. A small boy dressed as a clown on Halloween, but holding a big, bloody knife. This all happens in the first seven minutes John Carpenter’s Halloween, including the credits. In this time, in three shots (including the credits), Carpenter has set up everything he wants you to know about the tone and rules of the movie. And he does this all in such a beautiful, simple manner, it’s just stunning—it’s no wonder it’s one of the most lauded horror movie openings ever. The next scene takes place several years later as Dr. Loomis (Donald Pleasence) is driven to an institution where Michael, the young boy from before, now lives. Dr. Loomis explains a bit of backstory about himself and Michael all while being driven in the dark. But not only is it pitch black, it’s raining. There’s thunder, lightning, then that music hits again and we are instantly triggered that something bad is about to happen—or rather, something already has. The inmates are outside and as Loomis gets out, someone steals the car he came up in. We never see who, just some large hands and a white robe, but we know it’s Michael, and now he’s free. It takes a full 11 minutes into the movie before we get our first glimpse of daylight, and it feels like we’ve finally found some safety, a place free from dread, after the oppressive darkness before it... until Carpenter’s unnerving score starts again. Where ever the young girl we’re watching, Laurie (Jamie Lee Curtis), is walking, she’s walking into danger—specifically, the Myers house. The camera cuts into the house and peeks out at her from behind Michael, but only we only see a small part of him. When Laurie walks away, Michael’s shoulder comes into the frame. We hear him breathing as he watches her, and it’s terrifying—and Carpenter is scaring us with nothing but a shoulder. This goes on and on and on. The music, the confusing points of view, and shots of shoulders or cars that are scarier than the entirety of most other movies, because they’ve been expertly set up to serve that purpose. Sixteen minutes pass in the film until we get our first “glimpse” of Michael. And even then, he’s so small in the frame we have to squint just to see him. He then appears as a torso to some school kids, partially in the front seat of a car following a boy home from school, and it’s obvious that it’s going to be a while until Carpenter feels finally reveals Michael to us. We still don’t know exactly what the hell we are so afraid of, and that makes him even scarier. As Laurie goes home with her friends after school, the scene begins with the camera following them slowly as they walk and talk. Everything ostensibly looks safe, but nothing feels safe because of the atmosphere of total dread Carpenter has created. Every single bush, tree, or house in the background could be hiding him—and Michael is indeed behind one of the bushes, peeking out before disappearing. Daytime, nighttime, it doesn’t matter: Carpenter has officially filled the world of Halloween with a danger that could strike anywhere, at any time. His camera movement and very specific refusal to show all but a glimpse of the villain has created a palpable fear in every single frame we’re watching. It still takes another 45 minutes for Michael to finally make his first on-screen kill as an adult. That means, in a 90-minute movie—a horror movie, an iconic, all-time classic horror movie‚ the bad guy only kills exactly three people in the first hour of the movie. One was in the past, the second is offscreen (the guy whose clothes he steals), and only the third takes place in the present. And yet, it’s petrifying. This isn’t about the killing. It’s about the timing. Of course, after Michael makes his first “new” kill, there are only 30 minutes of the movie left, so things pick up significantly from here. Nevertheless, Carpenter continues to keep things simple. For the rest of the movie, Michael will only kill two more people, making a grand total of five victims. And yet why is he so damn scary? Because during all of that time, Carpenter still keeps Michael hidden. Besides the shoulders, point-of-view shots, and heavy breathing, he even goes so far as to have a scene where Michael puts a bed sheet over his head to obscure his identity. However, after he kills his final victim, we finally get our first close-up look at him. It’s just for a moment, though, because his mask is almost always seen in the darkness. That then changes in the final few minutes of the film, when Michael finally goes after Laurie. At that point, we get lots of good looks at him. Carpenter even has Laurie remove the mask to reveal his actual face. When Michael isn’t seen, he’s invincible and scary. But once you do see him, really see him, he can be stopped, which is why Dr. Loomis finally arrives at this moment, shooting Michael repeatedly. Loomis unloads his gun on Michael, sending him out the window. It may look like it’s over... but it’s not. When Loomis looks down, Michael is gone and Carpenter gives us his final needle drop. His Halloween theme returns as the film begins to cut through all the locations we’ve just been in: the downstairs couch, the stairs, a hallway, outside of one house, another house, then finally the Myers house, and alongside the music, we hear the breathing. He’s alive. He could be anywhere. And that means nowhere is safe.